Calligraphy is unique because it is both an art form and a craft. It requires patience, creativity and is executed entirely by hand. My terms are there to make it easier for us to work together. 1/ A non-refundable deposit of 50% of the estimated total cost is due before I begin work. The balance is due on completion and before delivery. 2/ To reserve my services at a future date, 20% of your booking deposit is required. The balance to be paid before your stationery arrives. Your project will not commence until the deposit has been received & cleared. The balance is due on completion. 3/ 15 – 20% extra stationery must be provided. For rush inscriptions. 25 – 30% extra stationery must be provided. 5/ All guest details must be correct, any spelling corrections or changes to details will incur a fee. 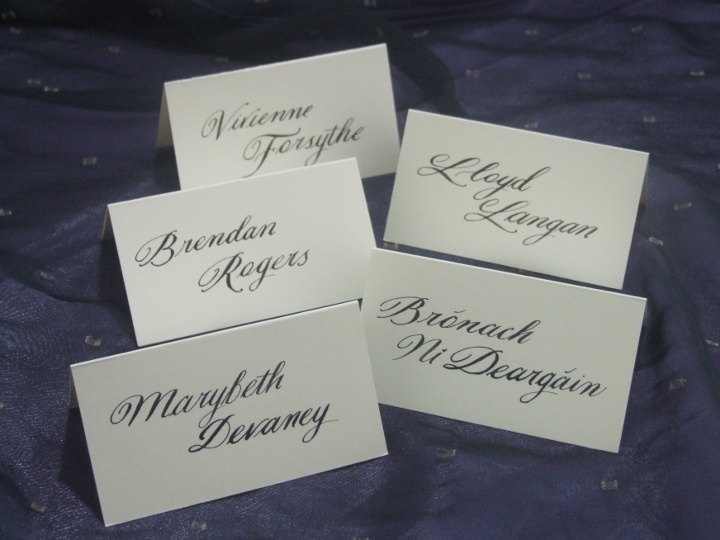 6/ Any additional guests added to your list received after your stationery has arrived will be charged as extras at the appropriate fee. 7/ Any changes and/or additions after the inscriptions have been completed will incur a “rush” fee. 8/ After the inscriptions are completed they will be checked once and any errors will be corrected. No additional guest names or addresses will be taken after this stage. Any extra inscriptions will be considered a new assignment and will incur charges as such. Any additions or corrections will incur a €45 setup fee plus the cost of calligraphy. 9/ Business days are Monday through Friday. If your job requires work on weekends, holidays or that I need to work through the night to meet your deadline there is a 50% rush fee. 10/ If you do not provide me with stationery or names and addresses by the agreed date, I reserve the right to cancel your order and keep your deposit. 11/ If you provide your stationery or addresses after the agreed date, your assignment will be considered a rush and billed as such. 12/ Any changes to the terms will nullify the agreement and result in a new agreement reflecting those changes.